The "S-curve" is a growth-investing phenomenon where a company's sales and profits grow rapidly. See how The Motley Fool incorporates this thinking into their real-money portfolio services. This article was originally published to Million Dollar Portfolio on Aug. 29, 2016. All stock returns are as of market close on Aug. 28. If you follow the financial media, you've likely noticed that stock prices often react to Wall Street's upgrades or downgrades. The majority of these adjustments are tied to a professional analyst raising or lowering a price target for a particular company, which is based on linear assumptions about performance. This could include statements such as "sales will increase 10% for seven years," or "earnings per share will grow 5% for a decade." For stable, predictable businesses, there's nothing wrong with these forecasts. Management for companies like Starbucks or Chipotle Mexican Grill might set a budget for how many stores they plan to open in a certain year. The profit stream that flows from each one of them tends to be fairly predictable. This information is also universally available, and most analysts have figured out what to look for in stable companies' earnings calls. The steadiness of their business is already baked into their stock prices. This is why -- major financial crises aside -- you never see Starbucks knock it out of the park in a particular quarter. In fact, the company has exactly matched consensus earnings estimates in three of their past four quarters. But for innovative companies in evolving markets, the profit stream is significantly less predictable. Founders and managements are making decisions to gain a foothold in markets that may not even exist yet. Customers are still familiarizing themselves with the new products and figuring out how best to incorporate them into their existing processes. The inputs for Wall Street's spreadsheets have a high degree of uncertainty, which can result in price targets that are all over the place. In short, it almost never works to forecast based on linear assumptions for growth companies. As such, when a growth company "beats estimates," it often does so in spectacular fashion. Once the mass market starts adopting the company's products, sales and profits can shoot up quickly over a short period of time. If a company reaches the middle section of the S-curve, other investors get more comfortable and jump onboard as well. This tends to push the stock price even higher. This is a phenomenon that is to the advantage of the growth investor. Our goal is to find and buy companies today that exhibit signs of reaching the middle of the S-curve tomorrow. This brings us to a difficult, yet very important question: What metric goes on the Y-axis? It should be performance-related and predictive of future stock returns, yet still be upstream of traditional metrics like earnings or cash flows. The answer lies in a company's business model. If we can figure out where and how a company generates their profits, we can find signs of whether it's on the right track. For example, if a company's profit margins come from the upfront sale of products, it'll need to find a market that desperately needs new solutions and is ready to buy. If the company is selling subscriptions, it'll need to sign up lots of new users and show high retention rates. We can also look for things that are more philosophical than hard-and-fast metrics. Developing competitive advantages -- such as a strengthening network effect or increasing switching costs -- are important to keep the competition at bay. Higher-level questions such as -- Where are people spending their time? (on the web vs television) or How is the definition of "value" evolving? (the convenience of two-day shipping vs lower price) -- are also highly relevant. Let's take a look at a few actual recommendations in our Motley Fool universe, which have reached the middle of the S-curve and produced high returns for long-term investors. Apple (NASDAQ:AAPL) made a name for itself as a personal computer manufacturer. But it was actually the launch of its mobile devices -- like the iPod in October 2001 and the iPhone in June 2007 -- that really cranked up the volume of the stock returns. Apple's meticulous attention toward design, in building the supporting iTunes ecosystem, and getting subsidies from US telecom carriers allowed management to price products at a premium. Investors who recognized the potential impact of this strategy early on have seen a nearly 10,000% gain since 2001. Click to enlarge images. Sources: Statista, Y-Charts. Netflix (NASDAQ:NFLX) began by mailing DVDs to members across America for a fixed monthly subscription fee. But it was the launch of its online streaming service in January 2007 that really drew investors' applause. Broadband internet had finally reached the mass market, which enabled high-definition movies to be streamed instantly, directly into customers' living rooms. With content and infrastructure costs largely fixed, new users could be added at a very low cost. Investors who saw Netflix's growing user base as a sign of surging profits reaped big rewards: The stock is up more than 2,000% since January 2007. Facebook (NASDAQ:FB) began as a collegiate social network, which quickly grew its user base as it expanded to additional universities. Users voluntarily provided their interests, which served as the foundation for targeted advertising that provided advertising customers with an excellent return on their investments. Early shareholders who believed in the potential of Facebook's rapidly growing mobile user base saw great returns, as well. Mobile now accounts for 84% of Facebook's revenue, and the stock is up more than 200% since going public in May 2012. There are other companies who also appear to show signs of approaching the S-curve but haven't seen the story play out just yet. Consider the following as a few additional examples from our Million Dollar Portfolio and our Watch List, which we think we're ahead of the curve on. Illumina (NASDAQ:ILMN) makes two-thirds of revenue from consumable material sales related to genomic sequencing tests. The number of genomic sequences run globally has increased from 40,000 in all years up to 2013 to 200,000 in 2014 and 600,000 in 2015. We believe this accelerated growth rate will continue -- driven by state-sponsored Precision Medicine Initiatives and the fight against cancer -- which would result in a high-margin future profit stream for Illumina. Veeva Systems (NYSE:VEEV) is a software-as-a-service provider that makes sales and R&D more efficient for the life sciences industry. Veeva's workhorse CRM software has brought more than 400 customers onto the company's platform, including the world's largest pharmaceutical companies. Customers are expanding their licenses to include other products as well, with management guiding for 100% growth this year in "non-CRM" products (such as Vault and Network). Successfully upselling an existing customer base is an excellent formula for success and a way to quickly expand margins and shareholder profits. Splunk (NASDAQ:SPLK) makes sense of messy data, which is exactly what many companies need these days. 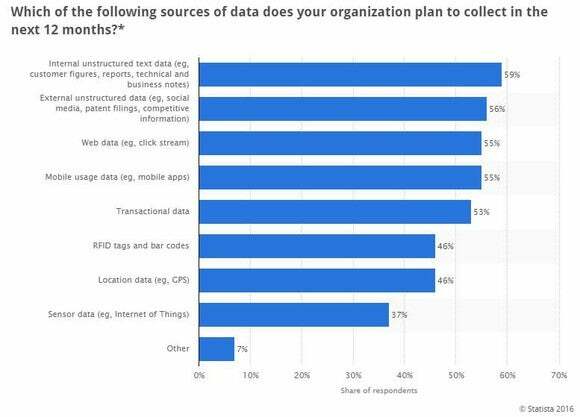 Internal and external unstructured data (Splunk's playground) were the two most popular forms of data that organizations planned to collect last year. The company now has 12,000 customers and has nearly a half-billion dollars of deferred revenue. The number of large orders (>$100,000) is also growing, as customers are increasingly opting for Splunk's "all you can eat" Enterprise Adoption Agreements. Click to enlarge image. Source: Statista/Economist Intelligence Unit. Million Dollar Portfolio advisor Matt Argersinger and I traveled to Austin's South by Southwest festival earlier this year, which featured some of the country's most forward-thinking companies. At the event, I'll never forget a quote we heard from Under Armour CEO Kevin Plank: "Data is the new oil." I bring that quote up, because you'll notice a common theme in the companies mentioned here. They are all using data to get smarter and to get an edge over their competitors. It's the same strategy employed by Amazon and Google parent company Alphabet, who have successfully developed two of the strongest competitive moats in the entire tech world. Companies who keep a wide peripheral view to gather information and then invest aggressively in the best opportunities can produce some pretty incredible shareholder returns. We're taking the same approach for our Foolish investments: casting a wide net and making small initial bets in companies that we believe show signs of huge potential. We'll continue to break the traditional Wall Street mold and will keep bringing innovative companies to our portfolios.